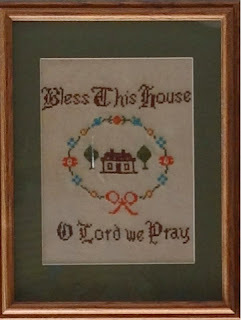 "Bless This House O Lord We Pray"
and under the watchful and often critical eye of our teacher Miss Bradstreet we learned the fine art of hand embroidery. Even before my needle hit the fabric I knew that I would make this special sampler for my grandmother and would give it to her for Christmas. I did just that. The gift was received with much love, admiration and appreciation of all the hard work that had gone into it. She loved it and treasured it for many years, displaying it proudly in her home until the day she died nearly 20 years ago. At that time my mother took down from the wall and gave it to me; she knew I would want it. Of course I had every intention of cleaning and reframing it "another day". But by now you know "another day" never came. Instead it stayed packed away out of sight and out of mind. 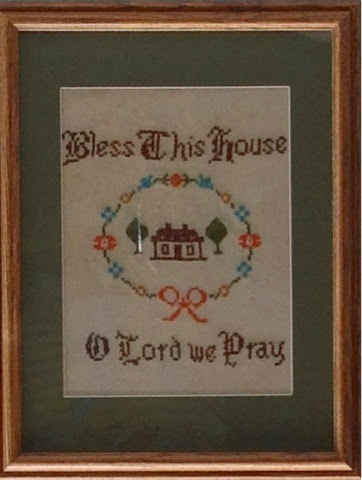 A few weeks ago in search of something else, I came across the handstitched little sampler. I was surprised and dismayed to see how discolored and worn out it had become. 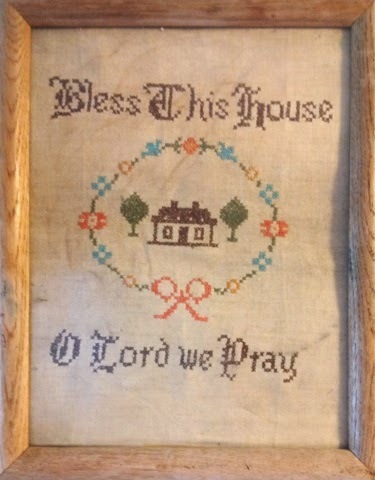 It made me sad to see the once cheerful sampler that had brightened my grandmother's home look so dreary. I knew then that this was to be my next project. I carefully cleaned it the best I could using a bar of the old fashioned Fels Napa Laundry Soap and it did wonders. As I gently hand washed the old fabric I recalled my "12 year old self " laboring over the tiny stitches a lifetime ago trying my best to make this gift beautiful. Only now, through the adult lens can I see how crude and uneven the stitches are. How the back is sloppy, knotted and frayed. Funny how I never saw these imperfections. I had never thought it was poorly made. Look who is "rockin the booties" that I made! 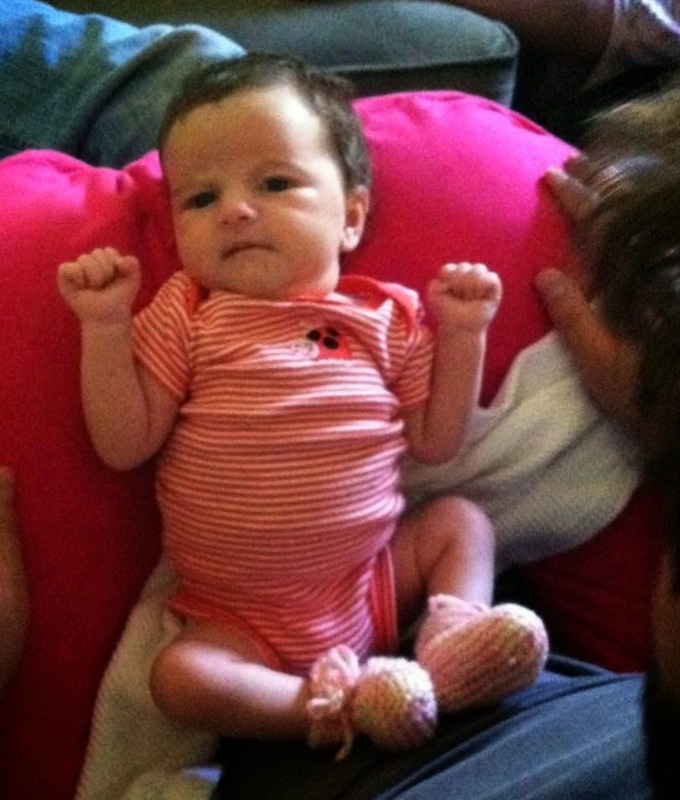 My friend's grand-baby Joliana models her new booties and they are a perfect fit. This pattern is the best ever and simple to make. They work up quick too! It is one of the few bootie patterns that actually stay on the babies feet. and is intended for charity use. Booties are made and donated to families of "at risk babies". to make a pair for an infant in need. As the summer winds down I can't help but notice the days becoming shorter, the nights becoming cooler and my stash of unfinished projects getting bigger. I head back to school in just two weeks and I ask myself; where did the time go and what have I accomplished? "Not much" is the only honest answer. I have made little leeway in my efforts to finish my orphaned projects. I have lagged in my attempt of slaying the " BEAST "of procrastination. Why you ask? FACE-BOOK! That's right .... FACE-BOOK; that time eating, social media craze has hooked me but good. I willingly let it waste precious time; time I will never get back. I have spent countless hours perusing family and friend's pictures and status updates when I could have been knitting. I spent precious time looking....or should I say lurking at old friends and yes, old boyfriend's pages when I should have been sewing. I even took up precious time to post my own updates and photos while I set aside project after project for another day. Countless hours wasted. I should have been finishing the closet full of uncompleted projects, instead you of sitting with my I-Pad devouring the pages of other people's lives and accomplishments. I've always had trouble with time management which is exactly why I am in this predicament. Exactly one week ago I DEACTIVATED my FACE-BOOK Account and I feel free. I am back on track. I made my way back to "the Closet" and pulled out yet another skein of yarn. 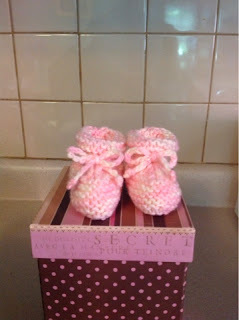 I don't know what my original intention was for this soft pink baby yarn but it was put to great use for these "itty bitty" baby girl booties I made for my friend's new born grand-daughter. It was a pattern I have wanted to try for a very long time.